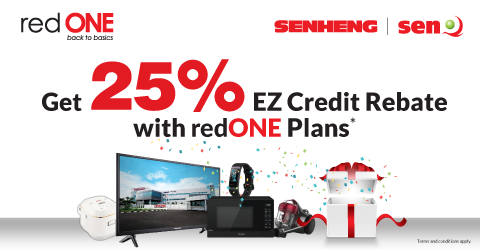 Redeem your EZ credit rebate* on mobile devices or electrical items in Senheng & senQ outlets nationwide! Register these exclusive plans at Senheng & senQ outlets only! 1The Advance Payment price displayed is subject to Service Tax which will be added into the grand total during sign up. Bundle58-12M and Bundle58-24M plans' Advance Payment is made up of twelve (12) months' commitment plan and twenty-four (24) months' commitment plan respectively. 2The 25% EZ Credit points are calculated from the twelve (12) months' and twenty-four (24) months' commitment plan Advance Payment (not including Service Tax) respectively. This is a promotion to attract customers to Senheng and senQ with an attractive offer. You can redeem EZ Credit rebate on mobile devices or home electronics when you subscribe to a redONE BUNDLE58-12M or BUNDLE58-24M plan. How long is this promotion available? This promotion will begin on 1 March 2019 2019 to 30 June 2019. Where can I sign up for this promotion? You can sign up at any Senheng & senQ branches nationwide. Who is eligible to sign up for this promotion? This promotion is open to all Senheng and senQ Plus One customers who would like to take up a new line with redONE or MNP port-in a number. I am an existing RP8 customer with 3 months remaining on my contract. Can I take up this promotion? No, you cannot. However, you can sign up a new line or port-in a number to enjoy this offer. Is there any Registration Fee or Deposit required for this promotion? The RM10 Registration Fee is required. However, the default Deposit is waived. Is there any advance payment for the plan required for this promotion? Yes, you will need to pay 12 months’ commitment fee for BUNDLE58-12M or 24 months’ commitment fee for BUNDLE58-24M advance payment (including service tax). However, the advance payment will be used to offset your following month’s bill from redONE. Will I be tied to a contract if I sign up for this promotion? Yes, this promotion is subject to a contract period of 12 or 24 months. Why do I need to sign a contract to enjoy this promotion? This is a subsidised promotion from redONE and the contract is to ensure that you will remain as a redONE customer for a minimum period of time. I signed up for the BUNDLE58-12M plan. What happens when I exceed my monthly high speed data quota? Once you have exceeded your monthly bundled high speed data quota, the data connection will be slowed to a maximum of 64kbps, depending on your location and current network conditions. Can I port-in my line from another operator to enjoy this offer? Do I need to pay for the advance payment when I request to port-in my line to BUNDLE58-12M or BUNDLE58-24M plan? No, the advance payment will be collected after the MNP port-in request is successful. You will need to go back to the Senheng or senQ branch where you requested for the line to be ported-in. After I take up this promotion, am I allowed to upgrade my monthly data bundle? What happens if I terminate my line within my contract period? You will incur the early termination penalty as per your signed contract. The early termination penalty will be RM58 x the balance of the contract month(s). redCALL is a Value-Added Service (VAS) that enables high voice usage customers to make unlimited voice calls to all networks in Malaysia. Do I need to activate/ subscribe redCALL? No, redCALL will be activated automatically once your BUNDLE58-12M or BUNDLE58-24M Postpaid Plan is registered or ported-in successfully. I don't want the redCALL service. Can I terminate it? No, you cannot terminate redCALL service. It is bundled with the BUNDLE58-12M or BUNDLE58-24M Postpaid Plan for you to enjoy unlimited calls to all networks in Malaysia. Is there a Fair Usage Policy for the unlimited voice calls? Yes, Fair Usage Policy of 100 hours per month is applicable. What happens when I exceed the Fair Usage Policy for unlimited calls? You can continue to call other networks' numbers at RM0.15 per minute for the remaining days of the calendar month. All prices displayed exclude Service Tax which will be imposed on you in your monthly bill. This promotion is valid starting from 1 March 2019 to 30 June 2019. This promotion is valid for New and MNP port-in Senheng and senQ Plus One customers only. Corporate and M2M customers are not eligible for this offer. The plan can be registered as a Master account /supplementary account (valid for new registration only). Only lines successfully registered and successfully ported-in will receive the FREE EZ Credit. Monthly access fee for the BUNDLE58-12M and BUNDLE58-24M plan is only for the bundled high speed data and unlimited voice calls to all networks in Malaysia and fixed line numbers, not for video calls and voice calls to special numbers. The bundled high speed data and unlimited voice calls to all networks in Malaysia are applicable for domestic usage only within Malaysia network. Roaming and IDD are chargeable based on Pay-Per-Use (PPU) rate. Deposit is waived for the default credit limit. In the event the user requires a higher credit limit, then standard deposit is required as normal procedure. Twelve (12) months' commitment plan advance payment (including service tax) is required for BUNDLE58-12M plan. This advance payment is paid via EPP. Twenty four (24) months' commitment plan advance payment (including service tax) is required for BUNDLE58-24M plan. This advance payment is paid via EPP. Upon 100% utilisation of the bundled high speed data, the subsequent usage will be drawn from the basic Internet data throttling at 64kbps speed. Customer may opt to purchase Data Top Up to continue surfing the Internet at high speed. Basic Internet is the standard 64kbps speed. Customer cannot change their plan during the 12-months or 24-months contract period. Any change plan while contracted, the customer will be charged a penalty of the monthly commitment x balance contract month. In the event of termination, there will not be any pro-rated billing on your last bill; you will be charged the full month’s commitment fee. The redCALL Value-Added Service (VAS) offers unlimited voice calls to all networks and is applicable for domestic usage within Malaysian networks only. Video calls and voice calls to special numbers are excluded. The redCALL VAS is bundled with BUNDLE58-12M and BUNDLE58-24M plan and is not optional. The redCALL VAS will be auto renewed on the 1st of every month. In the event where the customer wants to change his/her subscribed plan from BUNDLE58-12M and BUNDLE58-24M to another plan, the subscription to redCALL will be automatically terminated.